Kuwait City, Kuwait – 28 November, 2018: Less than six months after New York cult burger venue Black Tap debuted in Kuwait, the food lovers’ favourite has responded to increasing consumer demand and has opened a second outlet at 360 Mall in Kuwait. 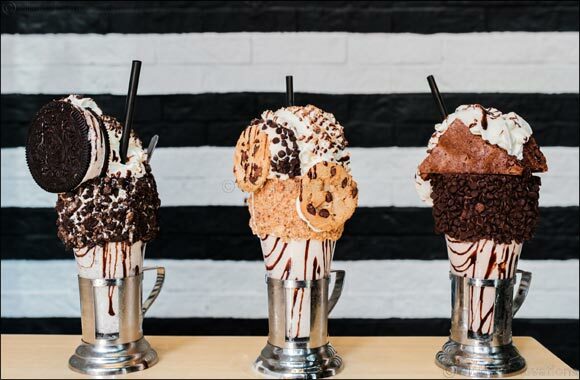 Black Tap’s famous craft burger creations and monster CrazyShakes have established the casual dining concept as a perennial hotspot and Instagram sensation in the hearts and minds of Kuwait’s diners. And now 360 Mall regulars can look forward to joining the Black Tap party; families and foodies living close to the popular mall will now be able to easily enjoy tucking into the restaurant’s award-winning meat patty specials and legendary milkshakes. “We’re thrilled with the excitement we’ve seen at our first Black Tap Kuwait location and can’t wait to welcome even more fans to this second location at 360 Mall,” said Black Tap owner and restaurateur, Chris Barish. Black Tap’s cool, street-themed vibe is renowned for permeating the interior design, character and set-up of every single outlet. That history will be amplified in Black Tap’s 360 Mall outlet, where renowned graffiti artist, Fumero - a long-time Black Tap creative partner in the US - will create a signature wall mural, his first in the Middle East. Fumero will use his unique street art creation - dubbed Fumeroism - to promote family dining. “After all, the family that eats together stays together,” said Fumero. Having overseen the arrival of Black Tap in Kuwait City, Muath B. Al Roumi, General Manager – Group Marketing, Tamdeen Group, believes the new venue that has launched at 360 Mall – located in Al Zahra area - will further cement the brand’s crowd-favourite reputation amongst the country’s discerning diners. “Tamdeen Group’s relationship with Black Tap continues our rich history of shaping the consumer-lifestyle landscape in Kuwait through careful selection and management of world-renowned retail and F&B franchises,” said Al Roumi. The new Black Tap outlet at 360 Mall, which is now open to the public, will feature a host of never-seen-before features in Kuwait, so watch this space!